In August, the ARRL acted to address objections and concerns being raised by representatives of community and neighborhood associations regarding the Amateur Radio Parity Act of 2015 -- H.R. 1301 and S. 1685. "Clarity on Amateur Radio Parity" made it clear that the bill would not create new federal policy with respect to outdoor amateur antennas, nor would it require homeowners associations to approve huge radio towers. Now, a new video -- "The Amateur Radio Parity Act of 2015 -- Separating Fact from Fiction" -- doubles down on the arguments contained in the League's August statement. ARRL President Kay Craigie, N3KN, said the video will be made available on Capitol Hill to make sure that Members of Congress have correct information, instead of misrepresentations. "This short video is a companion piece to the 'Clarity on Parity' statement on the ARRL website," President Craigie said. "The video not only explains what H.R. 1301 and S. 1685 are all about but knocks down specific misinformation that opponents have been circulating on Capitol Hill." The nearly 6-minute video begins by explaining Amateur Radio -- especially its public service role -- in layperson's terms. It includes video clips of FEMA Administrator Craig Fugate, KK4INZ, who addressed the value of Amateur Radio in emergencies when he spoke at the ARRL Centennial National Convention in 2014, and of Sen Roger Wicker of Mississippi, the sponsor of S. 1685, the Senate bill. As the presentation outlines, radio amateurs living in deed-restricted neighborhoods may face "cookie-cutter prohibitions" on outdoor antennas. It notes, however, that the FCC recognizes a strong federal interest in effective Amateur Radio communication from residences and, in 1985, adopted the PRB-1 limited preemption of state and local regulation of Amateur Radio antennas. As the statement -- and now the video -- point out, the Amateur Radio Parity Act of 2015 would extend that limited preemption to private land-use restrictions. The legislation "takes the time-tested 30-year-old reasonable accommodation standard [in PRB-1] and applies it to deed-restricted communities," the video states. "Unfortunately, there is a smear campaign against this legislation, and we need to respond to these blatant lies." The Amateur Radio Parity Act of 2015 seeks common ground between radio amateurs in antenna-restricted communities and homeowners associations. The video stresses that neighborhood homeowners associations (HOAs) would have the flexibility to reasonably accommodate amateur antennas in a manner that best suits the particular community, although HOAs could not just say "no." The legislation also does not take away any jurisdiction from community associations, nor does it negate any private contracts, the video asserts. "HOAs, not the hams, will decide on height and placement of radio antennas," it says. "Amateur Radio operators in these communities just want a seat at the table to negotiate a reasonable accommodation from HOAs, but HOAs don't want there to even be a table." As the video concludes, "Opposing reasonable accommodation is just unreasonable." President Craigie suggested that League members could use the video at club meetings to help their fellow hams understand the legislation and show why it's so important to urge members of the US House and Senate to support the bills, which have more than 100 supporters in both chambers. "If your club has an e-mail reflector, Twitter feed, Facebook page, or newsletter, you could add a link to the video to make it easy for people to find it online," she said. Read more. Hamvention® General Chairman Jim Tiderman, N8IDS, is downplaying talk arising from an October 2 television news report and a more extensive and detailed October 3 Dayton Daily News article, that Hamvention might move from Hara Arena as early as next year. Tiderman characterized the reports "all speculation and rumor." "In light of the Cox Media (Channel 7) television interview and the ensuing Dayton Daily News article, I, as General Chairman of the 2015-2016 Dayton Hamvention, want to assure all interested parties that the Dayton Hamvention is fully committed to the 2016 Dayton Hamvention at Hara Arena and Exposition Center," Tiderman stressed in a statement. "We still keep an open mind to alternate plans, in case they become necessary. All successful businesses need to do that, and Hamvention is no different in that respect." The Dayton Amateur Radio Association (DARA) sponsors Hamvention. The media reports said Dayton-area officials have been working together to keep Hamvention in the Dayton vicinity, if not at Hara Arena in Trotwood, where it has been held since 1964. Dayton TV station WHIO reported on October 2 that the Dayton/Montgomery County Convention and Visitors Bureau has been in discussion with the City of Dayton on a plan to ensure that the world's largest Amateur Radio gathering at least remains in Montgomery County, should Hamvention have to find another venue because of Hara Arena's financial problems. According to Bureau President and CEO Jacquelyn Powell, this isn't the first year that officials have considered "Plan B options," the WHIO and Dayton Daily News reports indicated. According to the media reports, representatives of the City of Dayton, Montgomery County, Dayton Convention Center, and the Convention and Visitors Bureau will meet this month to review options for Hamvention organizers in the event a move from Hara Arena becomes necessary. Various alternative venues in the Dayton area are reported to have been considered, including the Dayton Convention Center and the Dayton Airport Expo Center, and the Dayton Daily News report said Tiderman has toured both facilities. Also raised was the possibility of holding the indoor exposition and the outdoor flea market at separate locations in the area, and ferrying visitors back and forth with shuttle buses. The Dayton Daily News account said word of Hamvention's possible move from Hara Arena stemmed from a July e-mail from Karen Wampler, director of Marketing for Hara Arena, which the newspaper obtained through a public records request. The Wampler family owns the 165,000 square foot, six-building complex. "We have shared the fate of the Trotwood/VenuWorks/Hara acquisition proposal with the [Hamvention] Chairperson and select board members of Hamvention," Wampler wrote in the e-mail, according to the newspaper account. "While we have kept them informed throughout the process, they are reeling. They have much to lose with Hara's closing and, like us, believed we were close to stabilizing Hara for future growth, rather than ending her nearly 60-year run." 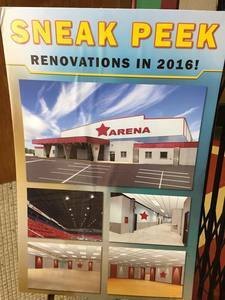 At Hamvention 2015 "Sneak Peak" posters in Hara Arena promised "Renovations in 2016." Since last year, the Wampler family has been working with VenuWorks, which specializes in restoring event venues, to rejuvenate the deteriorating facility. Karen Wampler acknowledged last winter that Hara was facing financial challenges, flagging revenues, and competition from other Dayton area venues and was exploring "a new ownership model." By the time Hamvention 2015 took place last may, "Sneak Peak" posters in Hara Arena were advertising "Renovations in 2016" and portraying conceptual sketches of what a refurbished Hara might look like. The newspaper account said that VenuWorks had recommended that the City of Trotwood purchase Hara Arena, but the Trotwood officials turned down the idea. That plan was the focus of Wampler's July e-mail, the Dayton Daily News article said. 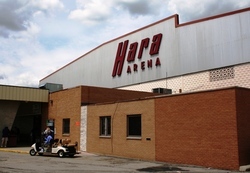 Wampler subsequently told the newspaper that Hara Arena is in better condition than it was when she drafted her July e-mail, and that the event complex will not close any time soon. Hamvention puts millions of dollars into the Dayton-area economy each year. Last May, the show attracted some 25,000 visitors. Hamvention 2016 will take place May 20, 21, and 22. Tiderman told the Dayton Daily News that "something catastrophic" would have to happen to cause Hamvention to move from Hara Arena. On behalf of the League, ARRL President Kay Craigie, N3KN, has congratulated the Hurricane Watch Net (HWN) on the 50th anniversary of its founding by Jerry Murphy, K8YUW. 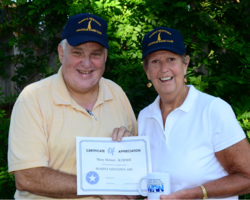 "Thanks to the efforts of the Net's dedicated and knowledgeable volunteers across 5 decades, Amateur Radio has played a key role in helping protect the lives of a great many people in harm's way," President Craigie told HWN Manager Bobby Graves, KB5HAV, this week in an e-mail. "The Net demonstrates how significantly Amateur Radio contributes to emergency preparedness and promotes international goodwill. Please relay to the Net's members my appreciation and respect for a half-century of outstanding service. Best wishes for many more years of successful operation of the Hurricane Watch Net." Graves replied, "It is an honor and pleasure to be a part of such a great group of ham radio operators with a rich history. I will certainly share your letter with our membership and, more importantly, with our founder, Jerry Murphy, K8YUW." Murphy founded the HWN in 1965 during Hurricane Betsy as "an informal group of radio amateurs who recognized a need to provide communications to and from hurricane affected areas." The net now enjoys a formal relationship with the National Hurricane Center and its WX4NHC amateur station. The HWN stood down on October 4 after activating more than once for Hurricane Joaquin, at one point a dangerous Category 4 storm. Graves called the activations "very successful in that we had many more reporting stations and lots of data to forward to the National Hurricane Center in Miami." The HWN had reactivated as Joaquin posed a threat to Bermuda after battering the Bahamas with high winds and heavy rainfall. "Joaquin passed just to the west [of Bermuda] as a Category 2 hurricane, sparing everyone from the extremely damaging winds," Graves noted over the weekend after the net had shut down for the last time. "For the most part, in addition to lots of heavy rain, on-and-off power outages were reported throughout the day." The HWN suspended its initial activation for Hurricane Joaquin on October 2, after 3 days of near-continuous operation, only to reactivate on October 3. Although the storm did not make landfall on the East Coast of the US, it caused torrential rainfall and severe flooding in the Carolinas, and has been blamed for more than a dozen deaths. The HWN activates on 14.325 MHz whenever a hurricane is within 300 miles of projected landfall or becomes a serious threat to a populated area. November 1 is the deadline for schools to apply for 2016 ARRL Education & Technology Program ( ETP) grants. The ETP offers two types of grants. School Station Grants are awarded to schools providing a plan to use Amateur Radio as part of an enrichment program and/or as part of in-classroom learning. ETP Progress Grants offer modest support to teachers now using Amateur Radio as an instructional tool who need additional resources for specific purposes. Progress grants are also available for teachers who need resources to start teaching wireless technology and electronics topics as part of a longer-range plan to involve Amateur Radio. A primary ETP objective is to boost wireless technology literacy among US students and educators through Amateur Radio. "Amateur Radio provides hands-on opportunities for students to learn about radio science!" said ARRL Educational Services Manager Debra Johnson, K1DMJ. "We look for commitment from teachers and school administrators, a well-conceived plan to use the resources to engage students, and a working relationship with local ham radio volunteers who are willing to serve as mentors," she explained. Applicants should review and complete the ETP grant application form. Submitted applications are evaluated on several criteria. The ETP depends upon the sustaining support of the Amateur Radio community. Since its inception in 2000, the program has grown to benefit more than 550 schools. The program welcomes your donation. For more information, contact Debra Johnson, K1DMJ, at ARRL Headquarters. 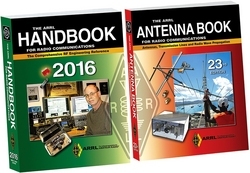 The 2016 edition of The ARRL Handbook and 23rd edition of The ARRL Antenna Book are now shipping. While supplies last, you can get the hardcover editions at the softcover price. If there's ever a time to complete your Amateur Radio bookshelf, this is the year. Filled with everything you need to stay immersed in the radio art, this dynamic duo is a must-have for hobbyists and technical professionals. The ARRL Handbook for Radio Communications is the standard reference for radio, electronics, and wireless communication. Since 1926, The Handbook has kept radio amateurs, professionals, and experimenters immersed in applied theory and do-it-yourself projects. It covers a wealth of information: The fundamentals of electronics and radio signals, construction practices, antennas and propagation, equipment and circuit design, and other useful reference information. There are projects for all skill levels, from simple accessories and small power supplies, to legal-limit amplifiers and high-gain antennas. The ARRL Antenna Book for Radio Communications has everything you need to design your own complete antenna system. Since 1939, The Antenna Book has maintained its place at the forefront of Amateur Radio technology -- a single resource covering antenna theory, design and construction, and practical treatments and projects. Updated to reflect the latest advances and technologies, this edition describes hundreds of antenna designs: wire, vertical, portable and mobile, and new high-performance VHF/UHF Yagi designs. The ARRL Handbook is available in hardcover and softcover editions from the ARRL Store or your ARRL Dealer. Hardcover: ARRL Item No. 0420, ISBN 978-1-62595-042-0, $59.95 retail, special offer $49.95 while supplies last. Softcover: ARRL Item No. 0413, $49.95 retail. The ARRL Antenna Book is available in hardcover and softcover editions from the ARRL Store or your ARRL Dealer. Hardcover: ARRL Item No. 0390, ISBN 978-1-62595-039-0, $59.95 retail, special offer $49.95 while supplies last. Softcover: ARRL Item No. 0444, $49.95 retail. Through the generosity of Alan G. Thorpe, K1TMW (SK), and the Stratford [CT] Amateur Radio Club (SARC), the ARRL Foundation has established the Alan G. Thorpe, K1TMW, Memorial Scholarship Fund. The fund will award $1000 each year to an Amateur Radio licensee enrolled in a 4-year undergraduate program. Thorpe, who died in 2011 at the age of 65, was a member and long-time president of the SARC. "It was my pleasure and honor to know Alan G. Thorpe, K1TMW, for 20 years," said fellow club member Bob Betts, N1KPR. "When he became a Silent Key, we learned that Al had left a significant trust fund designated 'for the benefit of Amateur Radio.'" Betts said Thorpe also made a separate bequest to the ARRL in his will. Al Thorpe, K1TWM, at the SARC W1ORS Field Day station in 2008. "Al believed in the basic tenets of our hobby: Education, promotion, and community service, and he directed all his available efforts toward those goals," Betts said. He noted that Thorpe had been involved in the Amateur Radio Emergency Service (ARES) and served as an Emergency Coordinator in the 1990s. Thorpe "strongly believed in the many and varied activities of the ARRL," Betts added. The ARRL Foundation will administer the Thorpe Memorial Scholarship Fund. Applicants must be US citizens. There are no requirements as to the field of undergraduate study. The first scholarship from the fund will be awarded in 2016. "We, the trustees of the Alan G. Thorpe, K1TMW, Memorial Scholarship Fund, are very grateful to the ARRL for its help and guidance in achieving Alan's wishes," Betts said. As of October 1, more than 350 US stations had signed up to take part in the 2015 Jamboree On The Air (JOTA). The 58th annual event takes place October 16-18, and JOTA organizers are urging all who plan to participate to register, so they can provide a list of participating stations and their locations. A list of US-registered stations is available on the K2BSA website. JOTA is aimed at fostering Scout-to-Scout communication across borders and is the largest Scouting event in the world. Last year worldwide Scouting participation included 1.1 million Boy Scouts and another 200,000 Girl Guides/Girl Scouts. In the US 13,326 Scouts and visitors took part in JOTA 2014. The Boy Scouts also encourage participating stations to submit JOTA reports and photos following this month's event. "We need your report to demonstrate the success of JOTA to those in Scouting and Amateur Radio," said Jim Wilson, K5ND, the national JOTA organizer. He asked participating JOTA stations to note down the number of Scouts participating, Amateur Radio licensees, and radios on the air, as well as the total number of contacts and states and countries contacted. "We would also like to see your best photos and hear some stories about your event," Wilson said. The K2BSA call sign will be in use for JOTA from every US call district as well as from KH6 and KL7. Wilson suggested that JOTA groups consider obtaining 1 × 1 special event call signs for their operations. Indonesia's International Amateur Radio Union member society ORARI (Organisasi Amatir Radio Indonesia) will host the October 12-16 IARU Region 3 triennial conference in Bali. IARU Region 3 includes the Asia-Pacific region. This marks the 16th Region 3 conference and the second time the event has been held in Indonesia. "It's an exciting time for us, as we continue to grow and thrive, remaining always adaptable, motivated, and responsive," said ORARI President Sutiyoso, YB0ST. "The world of Amateur Radio is an exciting area in which to work and play, and we'll continue to meet and bring inspired people together in forums like this, to ensure IARU Region 3 remains at the cutting edge." Heading the ARRL delegation to the conference will be International Affairs Vice President Jay Bellows, K0QB, who also serves as an IARU Region 2 director. He will be assisted by ARRL Chief Executive Officer and Secretary David Sumner, K1ZZ. Among matters delegates to the conference will consider are those referred from IARU Regions 1 and 2, and representatives from those regions will be on hand, as well as a representative for the IARU Secretariat. On the agenda are reports on topics that include the upcoming World Radiocommunication Conference in Geneva in November, new digital modes, the IARU's role in satellite launches, a UN push to lend heritage recognition to Morse code, and band-planning issues. IARU Region 3 coordinator reports also include ARDF, emergency communication, the IARU Monitoring System (Intruder Watch), international beacons, Region 3 awards, and the Support to the Amateur Radio Service (STARS) program. Conference documents are available on the IARU Region 3 website. The CEPT Conference Preparatory Group has held its final meeting leading up to World Radiocommunication Conference 2015 (WRC-15). Delegates to the gathering, which took place September 14-18 in Bergen, Norway, adopted the final European Common Proposals for WRC-15 and agreed on possible agenda items for future WRCs. Of particular interest to the Amateur Service was the adoption of a European Common Proposal for a 100 kHz allocation between 5350 and 5450 kHz. That proposal represents the views of the majority of CEPT countries, with the exception of Azerbaijan, France, Germany, Romania, and the Russian Federation. The proposal will be included in the documents for discussion under Agenda Item 1.4 at WRC-15, "where we anticipate long and drawn out arguments for and against an allocation," a report by Colin Thomas G3PSM, predicted on the IARU Region 1 website. Two possible Region 1-specific items for inclusion on the agenda of a future WRC are Agenda Item 1.2 -- to consider a primary allocation of 50-54 MHz to the Amateur Service, and Agenda Item 1.4 -- to consider a possible harmonized Amateur Service allocation in the band 1800-2000 kHz, based on studies regarding Amateur Service spectrum requirements. These proposals will be discussed in Committee 6 at WRC-15, "and we hope that at least one will be considered for inclusion in the agenda for the next WRC," Thomas said in his report. World Radiocommunication Conference 2015 takes place November 2-27. TX3X Chesterfield Island DXpedition Up and Running: The TX3X Chesterfield Island DXpedition came on the air on October 1 and has been creating a lot of excitement -- and possibly some exasperation -- on the bands. TX3X will conclude on October 12. Strong winds and heavy rain have caused the team to lose some time in setting up antennas. "While the 80 meter is antenna installed, under these windy conditions we are unable to install the 160 or 6 meter antennas," the team said in an October 7 update. "Conditions are erratic. Signals have been weak to moderate with some really strong openings." A goal of the TX3X DXpedition is to offer an all-time new one (ATNO) to as many DXers as possible. The 12-member TX3X team was hoping to log 80,000 to 100,000 contacts. Chesterfield Island is #21 on ClubLog's DXCC Most Wanted List. Visit the TX3X website for further information. The ARRL DXCC Department has approved the 2015 TX3X DXpedition for DXCC credit. 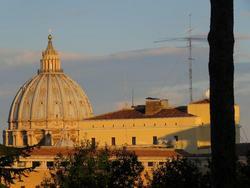 "DX Summit" in Rome to Pair with HV0A Vatican City Special Event: Francesco Valsecchi, IK0FVC; Martti Laine, OH2BH, and Giordano Giordani, IK0XFD, are organizing a "DX Summit" October 10-11 in Rome. During this event, HV0A will be active both days on several bands, as conditions permit. The activity will include a dinner party on October 10, featuring a presentation by OH2BH that will highlight the challenges of making DXpedition traffic run smoothly. The overall gathering will focus on areas of improvement that would be of interest to DXers and DXpeditioners, and Laine said a centerpiece of the summit would be the unveiling of "a new Q code [signal]." QSL HV0A via IK0FVC and LoTW. 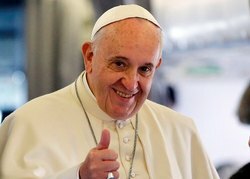 Pope Francis Visit Amateur Radio Special Events Log More Than 26,000 Contacts: Jim Nitzberg, WX3B, has reported that the recent multi-station special event operation to commemorate the US visit of Pope Francis logged more than 26,000 contacts. Nitzberg announced the tally as he thanked operators for participating "in this historic and fun event." The majority of contacts were made on HF -- especially on 20 and 40 meters -- but several also took place via satellites, moonbounce, repeaters, and even through IRLP and Echolink. "We had participation from New York, New Jersey, Washington, DC, Maryland, Pennsylvania -- including Philadelphia, where the World Meeting of Families took place, Virginia, and Delaware," Nitzberg said. "Many thanks to all that were involved in the various aspects of leading, organizing, and producing this event. It truly was a team effort and an example of Amateur Radio cooperation at its finest." Tad Cook, K7RA, Seattle, reports: Sunspot numbers and solar flux softened over the past week, with the average daily sunspot number declining from 120.9 to just 37, and average daily solar flux down from 122.7 to 93.8. These numbers compare the October 1-7 activity with data from the previous 7 days. The average planetary A index was way up -- from 5.1 to 24.3. The huge planetary A index reading of 77 on October 7 indicated a strong geomagnetic storm. Predicted solar flux for the near term is 80 on October 8; 85 on October 9-10; 90 on October 11-12; 95 on October 13-14; 100 on October 15; 130 on October 16-18; 125 on October 19; and 120 on October 20-25. Solar flux is expected to decline to 85 on November 1-3, then rise to 130 on November 12-14. Predicted planetary A index is 48 on October 8; 18 on October 9; 12 on October 10-14; then 8, 10, and 12 on October 15-17 and again 8, 10, and 12 on October 18-20, followed by 8 on October 21-27. Sunspot numbers for October 1 through 7 were 73, 58, 47, 18, 15, 24, and 24, with a mean of 37. The 10.7 centimeter flux was 119.7, 107.4, 96.9, 88.3, 82.6, 81.4, and 80.5, with a mean of 93.8. Estimated planetary A indices were 11, 14, 11, 20, 18, 19, and 77, with a mean of 24.3. Estimated mid-latitude A indices were 8, 9, 10, 16, 12, 11, and 44, with a mean of 15.7. In the Friday bulletin, look for an updated forecast. Send me your reports and observations.